Asphalt, maintenance, repair, installation, and construction services for businesses. Think of that critical first impression you make with your customers as they drive up to your brick-and-mortar locations. Are there potholes, cracks or crevices? Does poor grading create random dips and rises? If so, this is the first thought your customers have as they walk in your door. There are many businesses that require acres of blacktop and asphalt maintenance. And for most of these owners and operators, the shape and condition of their pavement doesn’t even make the list of the 100 things they need to do that day. They have a business to run. And they assume that their paved areas are never an issue. Basic Construction Company shares this belief. Whether you issue a formal RFP or you’re simply trying to find the right firm to handle your large-scale asphalt needs, it’s critical to have a good idea of all the work that’s needed to get the job done right. This includes getting the most accurate (and competitive) cost estimate, preparing and grading a site, the selection and application of the asphalt, any necessary utility and sewer construction – and the hundreds of details we’re not including here. Basic Construction Company has all the people, materials and solutions under one roof to complete any size business paving job, whether we’re breaking ground or cleaning up someone else’s dirty work. We take pride in creating superior parking lots and paved surfaces. And we’re confident that they’ll stand the test of time for your customers. Need Asphalt Maintenance for Your Business? Call Basic Construction Company! We have the experience, capability, equipment, and personnel you require for any of your paving or paving repair needs. Call (757) 249-3789 or contact us to discuss your next ashpalt maintenance or paving project today. 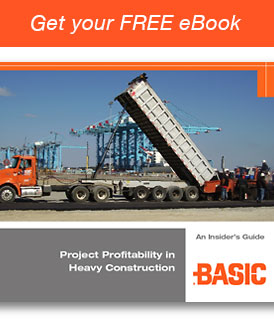 Improve the profitability of your heavy construction project through value-selling. Our eBook explains how.